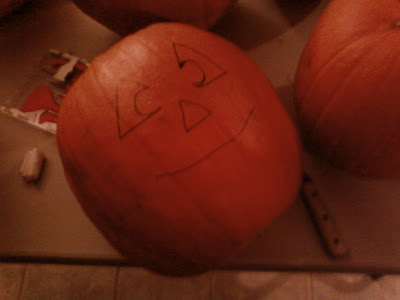 Do you remember the Meta Halloween party where my friends and me carved some pumpkins ? 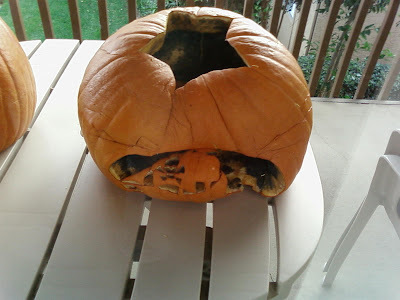 Well, actually our pumpkins are melt down :-( . I'm so sad for my pumpkin..... but the important is that I've learned to do them !! Next year I'll import pumpkins carving party in Italy :-D.
Another good idea come up from Elcomsoft . Their password crack software uses GPU accelerator instead CPU in order to increase the cracking velocity.To know more about this fast method read advertising this paper . This topic arrives at the same time of a passwords security brief that I'm summarizing for a note Italian Magazine for this reason I feel very close to this kind of problem. As I'm writing the password chose is really important to guarantee enterprise safety. Using Mnemonic Password Formula (MPF) in a world where every service is owned by different account has become capital. MPFs are easy to remember for the end user and hard to crack in fact they follow a random character probabilistic distribution. The following pictures represent easy but useful Mnemonic Passwords Formula. Where the initial number represents the typology of the password. For instance the number "0" can represents that password is used for private purpose instead "1" for work purpose. This morning I've become crazy to sign a .jar application with automatic tools. At the end I've discovered that Ant got this skill and all around me become easier. I put here a really easy example of Ant build.xml with the principals command to sign jar application hoping it could be useful to everybody. Last year I posted on java bug-track some security issues about java security engine. Today I've found some free time and I've seen if some of these security issues have been corrected . Well I've founded again some problems on java byte code caused from bad flags checking. The main problem concerns the poor connection between compiler and linker on java core verifier. Let me try a really easy example. Write A.java and B.java classes in the following manner. Well, try to compile A and B (javac *.java) and try to run B ( java B). Nothing strange yet. Right now all these stuff work fine but if you try to modify the public field (public int value=200)in private one (private int value=200) compiling only A.java (javac A.java) you'll observe that java B behavior will not change ! What happened ? The linker has not been upgraded. Yep, but how can we apply this "linker miss upgraded" to normal life ? Every commercial software has a protection, often the protection is a serial number or a license code. The software has to control about the correctness of inserted number and to do that it often uses a private function "serialNumber(String serial)". If we don't know any reverse engineering technique we should change the "serialNumber" private function in a public one afterward forging a brute force code able to exploit the previous function. Let me try with an different but easy example in order to understand the Java Code Violence technique. This class has a private function named sum. We assume to have only .class code and not the sources. With java decompiler (javap -c -private ) we can understand the name and how many private variable/method the .class got. Our attack will focused on private static int sum(). The main goal is to change this function from private to public, in order to do that we can use a simple java hash interpreter as DataWorkShop. Open The .class file with JavaInterpreter and search for private static int sum(). The right method is the number 3, it's easy to understand from previous javap screen, change the private value from "YES" to "NO" and save the poisoned code. Well, now we should forge two specific java classes, the first must named as the attacked class and it must have a fake public method called as the attacked class' private method. The second class is the true attacker 's class able to use the private method, in these images it has been called Violence.java. Now compile Violence.java and then remove the fake class named as the attacked class and rename the attacked class with its original name and run the Violence.class !! You have just bypassed the Java Security Engine. With the same principle you can modify private fields, private classes and of course private methods building self made classes that use private field of commercial classes. One of the most useful scenario is to build own brute forcer on a private "serial check" function. The problem is in the verifier engine. The Java verifier has the certifier task, it should control every piece of code before charge it in the right memory location. Also the java manager engine should control that run-time code does not damage JVM and/or machine memory but it seems not working so well. I hope that this easy kind of attack works only in my not-always-upgraded and old machines. What hackers do when they have too much time on their hands? Beats Of Boredom!One of the inner most basic hacker characteristic is the ability to take unrelated things and convert them into a perfectly balanced mix. Beats Of Boredom from adam deeves on Vimeo. HTTPBee is a swiss-army-knife tool for web application hacking testing. Multi-threaded high-performance tool with a scripting engine and agent-like behavior support. The way httpbee's scripting engine is implemented is relevant to httpbee architecture itself. Httpbee maintains a pool of threads that it uses for parallel task execution. Therefore execution of httpbee scripts is not linear. Instead, there are certain functions which are executed at certain steps of scanning proccess. The global scripting part is executed when the script is initally "scanned", so httpbee can pick up tags, desciption and other data from your script. init function will be executed only when your script is picked up and scheduled for execution (based on tags selection for example). once execution is launched, every time when a parallel thread requires a new request string. request function will be called. Whenever a response is received, your response function will be called and the request string, which produced the response will be given as parameter. Fini function will be called when execution of the script is completed and the script is about to be unloaded. Well, I've not tested yet the correct agent-like behavior but I think it could be interesting try it. If' some one find few free time to do-it please send to me "the Agent behavior report", we could discuss it ! Yep, you've read well ... META party ! 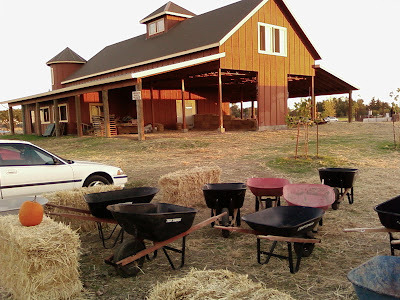 And this, the ex-house of our orange pumpkins ! ... We got it ! Here, Ann and Lavinia. 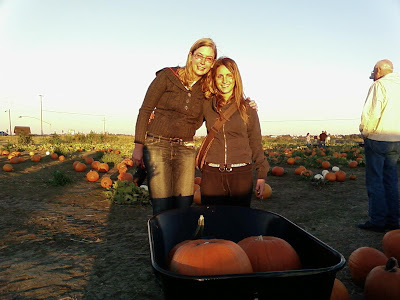 Ann is one of our best American Friends :-D. She carries us to this farm and she teaches us the "pumpkins carving theory" :-D.
Next step, painting your style on pumpkin surface ! Personally I've followed a "for dummies" template but it was so perfect for my costume ! And at the end..... after a long and wearing feat, here they are ! The carved pumpkin with light are ready to be published outside the door ! Some time I need video or picture tools able to record mouse movements or desktop actions. For instance during my first RoboAdmin movies I've needed something to record how RA was answering to users queries. Jing is a well formed project, available for MAC and for WINDOWS in both cases free, that with its nice transparent and solar interface snap pictures of anything on your desktop. It's really useful because it's can store your snapshot immediately online just ready to be linked on you blog ! New Application Luncher able to changing your real life ! MAC and MAC's developer are always one (or more) steps above the others OS :-D. You can understand that also seeing the new MAC application that keep out. Try to use QuickSilver, it's the most used Application Luncher for OS X, it's fast easy to use and mouse independent. But if you wanna be old style guy (100100110) maybe it's better Linux shell and not transform a really nice MAC in a rude shell black and green ! too many users on my old MAC, too many users for my poor connection, too many users unhappy about My poor server that's storing 2 sties and one Blog. Maybe blogger.com it's the best solution.